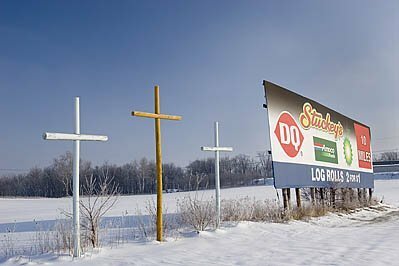 Richmond, Indiana - Three Christian crosses compete with commercial messages in a snow-covered field along Interstate 70 in eastern Indiana. The crosses are among 1864 sets of crosses placed along highways in 29 states by Rev. Bernard Coffindaffer. Coffindaffer made a fortune in the coal business in West Virginia and then spent his money putting up the crosses.